The ghastly likes of Marine Le Pen in France and Geert Wilders in the Netherlands have already hailed the Trump triumph as an inspiration for Europe, and for the entire globe. Racist xenophobes of the world unite, because its now our time! To that end, it would have helped if Morgan had more going for him in the charisma department, but then… maybe that flat, dogmatic aspect of his personality will work for him. 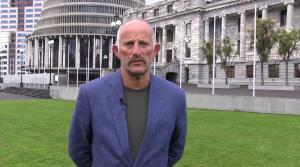 As will a climate where – Winston excepted – the main opposition parties will be straining to look like a credible and unthreatening government-in-waiting. In Labour’s case, this means that their policies tend to sound as if they’ve been internally pre-polled and manicured within an inch of their lives. For their part, the Greens have been saddled with the ‘well meaning but naïve’ curse ever since their inception. Even now, James Shaw readily comes across as the guy who has turned up at the front door to take your daughter to the prom. Nice, reasonable and responsible, almost to a fault. Yep, being the first country to proudly pass legislation implementing a pact that the new US administration has singled out for special loathing and contempt obviously puts us in a stronger position. This is like Wile E Coyote pedalling out into thin air, just before he looks down. It’s over, chaps. You missed out a major point – he is highly species-ist. Cats won’t be voting for him.